Basel is such a lovely city. My visit corresponded with the beginning of a heat wave and everyone seems to be enjoying being outside, especially along the Rhine. I spent a energizing day at the Beyeler Fondation – the current exhibition Gerhard Ricther is sublime. 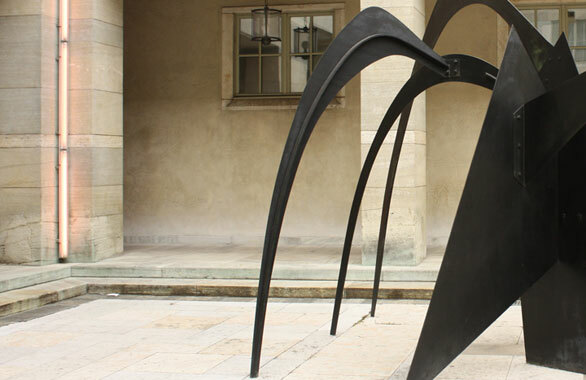 Next it was onto the Kunstmuseum to see a number of gems including some surprising Giacometti sculptures and Calder’s “Big Spider” from 1959. This sculpture is a visual surprise and an excellent example of aesthetic economy in structural support. Curved legs splay off their assumed trajectories, support ribs echo but don’t mimic, and the plates evoke danger and fragility. As with many Calders the sculpture reveals, hides, and then pops out at you as you encircle it. Clever, like-able, and engaging all at once.